The approximately four hundred Tyrannidae arranged in over one hundred genera makes the Tyrant Flycatchers (Tyrannidae), one of the most diverse new world bird families. The forty six North American species that migrate to and from North America on a yearly basis, also makes them one of North America’s most diverse bird families. Empidonax flycatchers and Tyrannus kingbirds account for almost half (21 of 46) the species. Flycatcher colors tend to move from drab to bold in Southern climates. 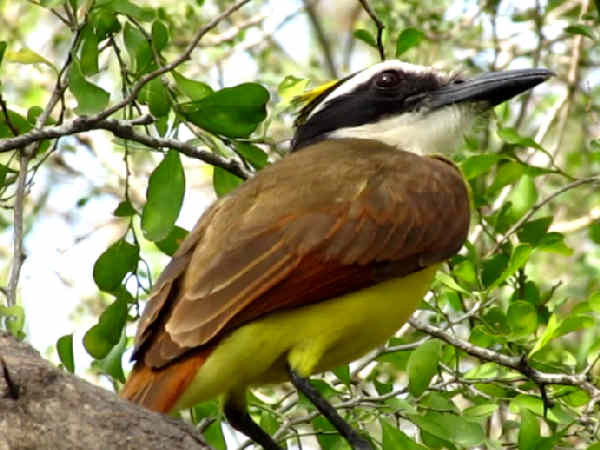 The large and colorful Great Kiskadee (Pitangus sulphuratus), pictured, represents the North American Pitangus genus. A year round resident in South Texas, its above average size, yellow belly and black eye-stripe make for easy identification. Unlike many other tyrant flycatchers, they are omnivores that actively hunt for small fish, amphibians, reptiles, insects and other birds. Known primarily as perching birds, all flycatchers tend to sit on tree branches and fence posts, scanning for insects in their territory. During migration they are common visitors to residential areas across North America. Professionals and birding enthusiasts keep track of flycatcher population numbers as a tool for gauging riparian forest ecosystem health throughout the country. The Southwestern Willow Flycatcher is a subspecies listed on the U.S. Endangered Species list. There are plans in place to restore the riparian habitat in its range. According to the U.S. Fish and Wildlife Service, the Guam broadbill, a small flycatcher from the island, was removed from the Endangered Species list in 2004 and is now considered extinct. 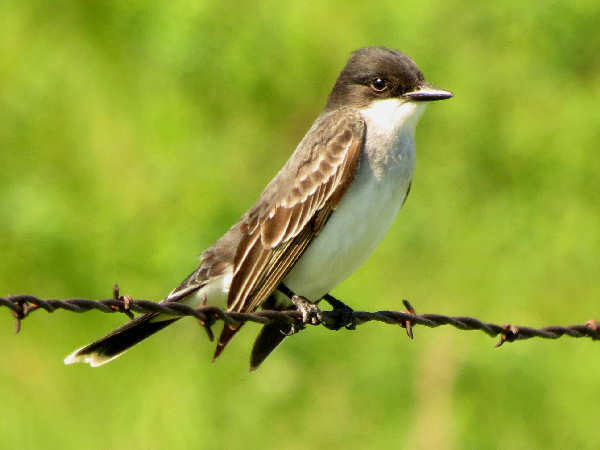 The Eastern Kingbird represents the Tyrannus genus for most of North America, with a range that extends from the Rocky Mountains to the East Coast. 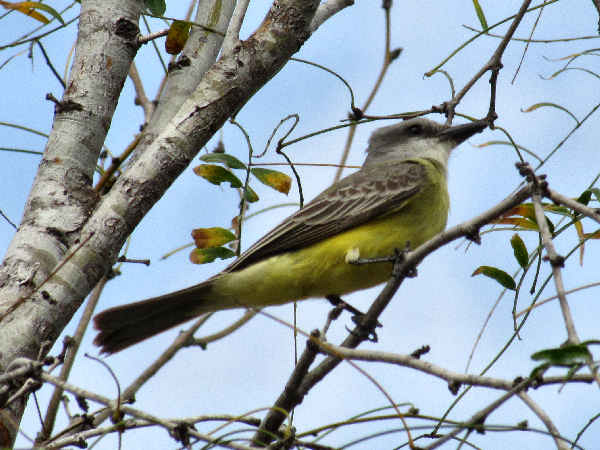 The picture shows one of the less common kingbird species, the Tropical Kingbird (Tyrannus melancholicus). 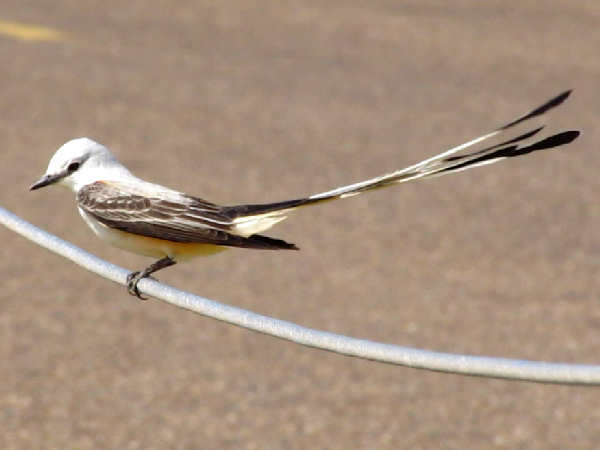 While not having the name kingbird, the Scissor-tailed Flycatcher also fits into the Tyrannus genus. Their extended tail, up to seven inches in length, make them easy to identify. 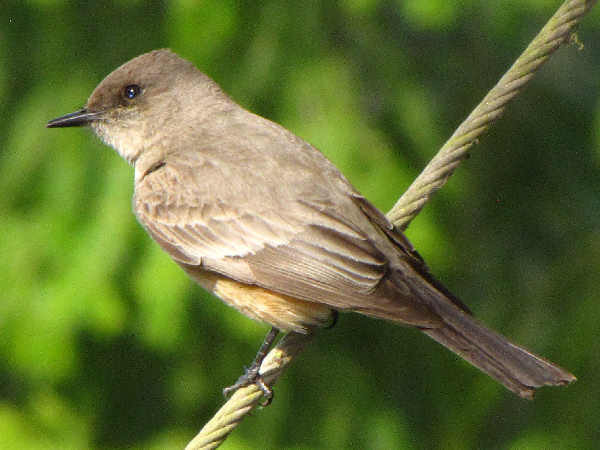 Say’s Phoebe (Sayornis saya), one of three native Sayornis species, inhabits open areas in the Western United States. They winter in Mexico and the Southwest. Breeding season means a migration as far north as Alaska. The pictures shows the bird’s rust colored belly and lighter color throat area. The gray to brownish feathers on the head and back are fairly common flycatcher features, as is the darker tail. As they perch, waiting for insects, they tend to bob their tail. 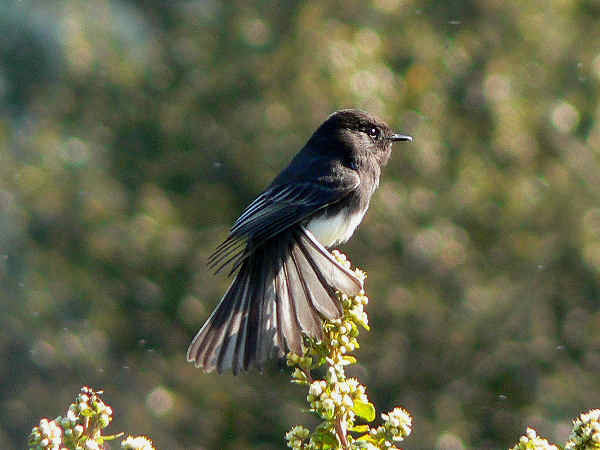 With the exception of darker feather colors, the Black Phoebe (Sayornis nigricans), resembles the Says Phoebe. Most buck the usual trend of migrating flycatchers, with many taking up year-round residence in a wide variety of open habitats in California and the Southwest, including residential areas. Black feathers on the top of the chest differentiate it from the more common Eastern Kingbird. 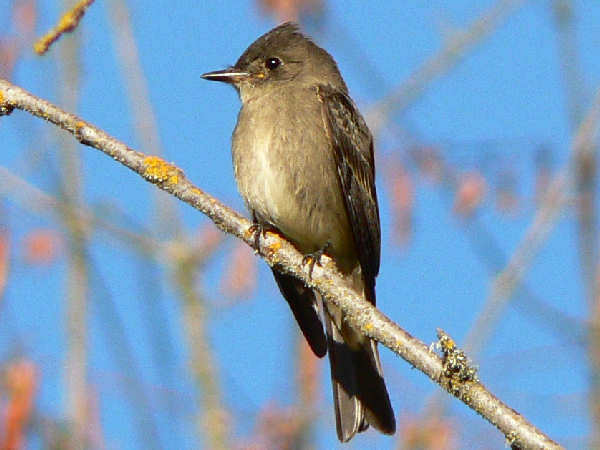 The Contopus genus, better known as the pewees, consists of about a dozen species, with four species, Olive-sided Flycatcher (Contopus cooperi), Greater Pewee (Contopus pertinax), Western Wood-Pewee (Contopus sordidulus), Eastern Wood-Pewee (Contopus virens), common North American migrants. The Western Wood-Pewee (Contopus sordidulus) inhabits forested areas throughout the Western North America during the summer breeding season. During winter, they migrate as far south as northern South America. The picture shows a Pewee in its usual perching status, on the look-out for insects, but still not too busy for a photograph. The eleven Empidonax species share physical characteristics such as being small to medium sized forest birds, with brown or olive feathers that helps them blend into their environment. In areas hosting multiple Empidonax species, flycatcher identification for any one species can be challenging. 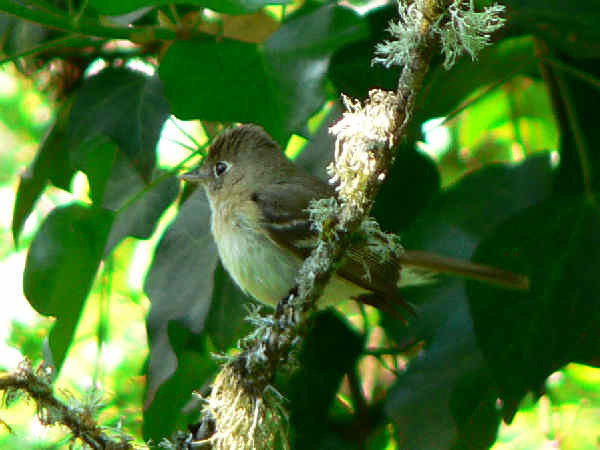 The Pacific-slope Flycatcher (Empidonax difficilis) fits the general Empidonax description. The tear-drop looking eye-ring serves as a good field identification clue. It breeds along the forested areas of western North America. During winter they migrate to the coastal areas of Western Mexico. 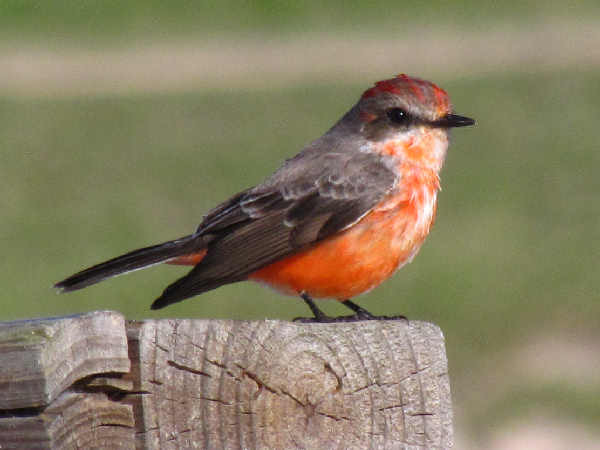 North America’s sole Pyrocephalus species, the Vermilion Flycatcher,inhabits riparian areas along the southern border. They are predominantly a tropical species, with the bulk of their population located in Mexico, Central and south America. The picture shows a male. Females have brown feathers with a light shade of red on the underside. Also of note, but not pictured, four Myiarchus species, Ash-throated Flycatcher (Myiarchus cinerascens), Brown-crested Flycatcher (Myiarchus tyrannulus), Dusky-capped Flycatcher (Myiarchus tuberculifer) and the Great Crested Flycatcher (Myiarchus crinitus) migrate to North America for the breeding season. The Ash-throated Flycatcher, the most common Western Myiarchus species, spreads its wings from Southern Oregon, west to Southern Texas. The rust color in the bottom of the wing feathers serves as a good field identification clue. Unlike other tyrant flycatcher species, Myiarchus adapt to multiple habitats, including deserts, grasslands, and lower elevation open spaces.